Stocks dipped at the open on stronger than expected GDP numbers, but recovered into the green within minutes. We cleared the minor speed-bump at 1640 and the next meaningful hurdle is the 50dma at 1660. The summer chop continues, but Labor Day next week marks the start of the Fall trading season and we should expect more involvement from big money. Their deeper pockets move markets and will finally take us out of this 1600/1700 trading range. The million dollar question is if they will they buy the late summer dip or sell the weakness? The knee-jerk reaction from many traders was selling the stronger than expected GDP numbers because they are still trying to trade the Taper. Months ago we lived in the bizarro world where strong economic numbers were bearish because it threatened easy money. Unfortunately for anyone trading in the rear view mirror, the Taper trade is already old news. We beat that poor horse to death this summer and the market is already on to something else. Right now that is fretting over Syria and welcoming the slow, but steady economic progress. People have a hard time believing the Taper trade is already dead because it hasn’t even happened yet. How can we safely ignore something that is still in front of us? Easy, the market is forward-looking and people trade their expectations of the future. I have yet to find a single person who thinks the Fed will continue buying $85 billion per month in debt all the way through 2014. That means most everyone expects the Fed to Taper some time over the next 15-months. In fact many are convinced it will happen sooner with most of the debate focused on September or January. People trade what they expect and the market expects Taper, so that means it is already priced in. No doubt there is some uncertainty surrounding Taper and the market hates uncertainty, but paradoxically that is a reason to buy the Taper weakness, not sell it. When the Fed starts tapering in a moderate and responsible fashion, it will remove a big piece of uncertainty. Since the eventual Taper will be less bad than feared, the market rallies on the news. Sell the rumor, buy the news. Rallying on the start of Tapering only seems irrational to those who don’t understand how the market works. Syria is a whole different can of worms and we should expect more near-term volatility as the political posturing ramps up, but this will be ancient history soon enough and we should buy when the missiles start flying. The market is finally firming up after digesting the Syrian headlines. Some hecklers want to give me a hard time because I remain constructive on this market while we sold off for a few days. I’m not sure what these people expect, but no one has a crystal ball and I never claimed the ability to perfectly time every daily move in the market. Many of these critics fail to realize successful trading is more about being wrong than right. It is easy to make money in the markets, just ask any monkey with darts. The harder part is keeping those profits. That is where discipline, risk management, and stop-losses save the day. Anyone can be lucky, but only the people who know how to be wrong will survive this game. But back to the markets, the runaway selloff really didn’t get started. While we slipped 5% from all time highs, the Tapering and Syrian fears cleared a lot of weak holders and brought in a new crop of owners willing to sit through this turmoil. The market is fragile here and traders remain on edge, but sharp selloffs are swift and this one never really got going, meaning we are not standing on a trapdoor. We are on shaky ground. That means one of two things, either this is a great buying opportunity, or the floor is about to fall out from under us. Major declines always start as small selloffs and we must always take weakness seriously. While we don’t need to run from it, we should respect it and that means watching for signs of dip-buying drying up. Every dip this year has been buyable, but eventually we will run into one that is not. We made a lot of nice profits this year, it would be a shame to let those evaporate as we stubbornly hold through the top of this rally. Bears and shorts need to tread lightly. They’ve been right the last couple weeks, but the goal of this game isn’t to be right, it is making money and the only way to do that is selling our winners. Selloffs are typically swift and this one is proving quite stubborn, meaning recent weakness is unable to shake many confident holders loose. Of course the one time selloffs grind lower is bear markets. While that is possible, it seems premature, especially given historically strong earnings and better than expected economic growth. Our next bear market is coming, but we need people to forget about the last one first. As for bulls, the market will likely remain choppy through next week as we wait for Syria to be resolved and bigger trader to come back from the holiday. While I remain optimistic, forcing a trade here is a good way to get chopped up in these swings. Stocks recovered some of yesterday’s selloff, ending the steady stream of selling, but feelings of uneasiness remain. We are still stuck near 1640, which provided support last week. Often what was support becomes resistance and today’s rebound could stall at this level. Of course support/resistance is proportional to the number of times the market bounces off a level. By that measure 1640 not all that meaningful and is a speedbump at best, but in a weak market it might only take a speedbump to derail this bounce. Yesterday’s selloff caught everyone by surprise and the dip-buying crowd held off, waiting to see how much better prices would get. The widespread anxiety didn’t come from what we’ve debated for months, but something new and unexpected. While events unfolding in Syria will likely have a limited economic impact over here, it is a new risk factor not previously priced in and is what made people so uncomfortable. We’ve been debating Taper for so long that everyone already made up their mind, but Syria is new and people didn’t have time to cement their opinions. Add in the pressure from a declining market and many simply chose to sell the uncertainty. All of this leaves us in a delicate position. Most people rationally realize Syria will be a non-factor just like Libya and Egypt, but markets hate uncertainty and all this political grandstanding is exaggerating the situation. Expect the market to remain volatile in the build up to a conflict, but rally after the start of military operations when everything becomes quantifiable. The one way selloff ended, but we are not out of the woods yet. Four percent from all-time highs is hardly oversold and there is plenty of air beneath us, so jumping all over this rebound is still a risky trade and counts as picking a bottom. While I am not worried about Syria, the crowd’s shifting sentiment concern me. Previously confident holders are no longer greedily expecting new highs and are considering selling for the first time in a while. Sometimes we don’t need a reason to sell other than everyone else is selling and that is what I am wary of. While I still think recent weakness is creating a buying opportunity, I would rather be a little late than a lot early. I remain optimistic in the medium-term, but recent weakness leaves me cautious. Every dip is buyable until it isn’t. We all know this rally is coming to an end and most of the times it is a fairly innocuous event that marks tops and bottoms. If tops and bottoms were obvious it would be easy to make money in the markets and we all know that is not the case. Yesterday’s “plunge” came on barely average volume, showing many holders continue holding. The risk is if we add in a little more weakness, that dam of confidence will shatter in a cascade of selling. Stay cautious as momentum remains with the bears. The Syria situation is overblown but markets rarely act rationally in the face of new and uncertain events. If the market rebounds to 1700, there will be plenty of time to get on board, so wait for stability and sanity to come back before buying the dip. Our goal is to make the easy money, not buy the bottom. Don’t forget, we remain in the choppy summer market and both bulls and bears should continue locking in profits early and often. AAPL slipped under $500 on yesterday’s weakness and how the stock responds to this level in coming days will be revealing. Will big money come in and buy discounted shares at $490, putting a floor under the stock? Or did everyone and anyone buy all the AAPL they could hold in the recent rebound and we are rolling over from a lack of follow-on buying? I’m still fearful of a buy the rumor, sell the news going into the Sept product launch. The iPhone5c is the worst kept secret since an Apple employee left an iPhone4 prototype in a bar a couple of years. Anyone buying in anticipation of a “cheap” iPhone surge will likely be disappointed unless Apple hits us with something revolutionary that hasn’t already been leaked out. Stocks are lower by a percent on fears of US involvement in Syria. This dip undercut the lows of last week as many traders take a sell first, ask questions later approach to the news. While the move is lower, we are still well within the summer’s trading range and this sideways chop is consistent with recent behavior, so at least for the time being, the market is not signaling the start of something new. Paradoxically wars are good for markets, it is the uncertainty leading up to the initial confrontation that weighs heavy on them. The start of armed conflict is a relief to markets and leads to powerful rallies as seen in WWII and the first Gulf War. The Syria “conflict” will likely be nothing more than a few cruise missile, or at worst air support for rebels like we saw in Libya. While we might experience a 25 or 50 cent spike in the price of gas, we lived through $4/gal gas before and will do it again. Through uncertainty comes opportunity. Everyone is fairly confident this Syria thing won’t be a big deal, but we don’t know for sure and that keeps buyers away. Traders selling this weakness are offering attractive discounts to those willing to take the risk. For one side it will be a good deal at the expense of the other, but only time will tell if this is the end of Syria based selling, or just the start. The gap lower at the open and the progressive slide lower is heightening the pain for those trying to hang on and is the cleansing process of setting the market up for the eventual rebound. No one can consistently pick bottoms and tops and I won’t try, but all these previous Middle East selloffs created buying opportunities and this one will likely end the same way. Markets often act irrationally and emotionally. As frustrating as that feels in the moment, those cracks in efficient markets allow us to profit from other people’s impulsive behavior. I have no idea how low this dip can go and picking bottoms is a fool’s game, but this weakness is creating opportunity. As for Syria, we’ve seen this story many times before and the worst fears are never realized, but we need to wait for the market to sort this out before jumping in front of it. We long knew Tapering was a non-issue and it was going to be something else that brought this rally down. Syria is new and few are actively promoted the impending Debt Ceiling. Together these two headlines could conspire to kill this rally since they are not currently priced in. Stay cautious, but be ready to buy with both arms when the missiles start flying. Syria is a non-issue, we just need to wait and see how much of a discount sellers are willing to give us first. Shorts can keep riding this down, but take profits early and often in this sideways, summer chop. 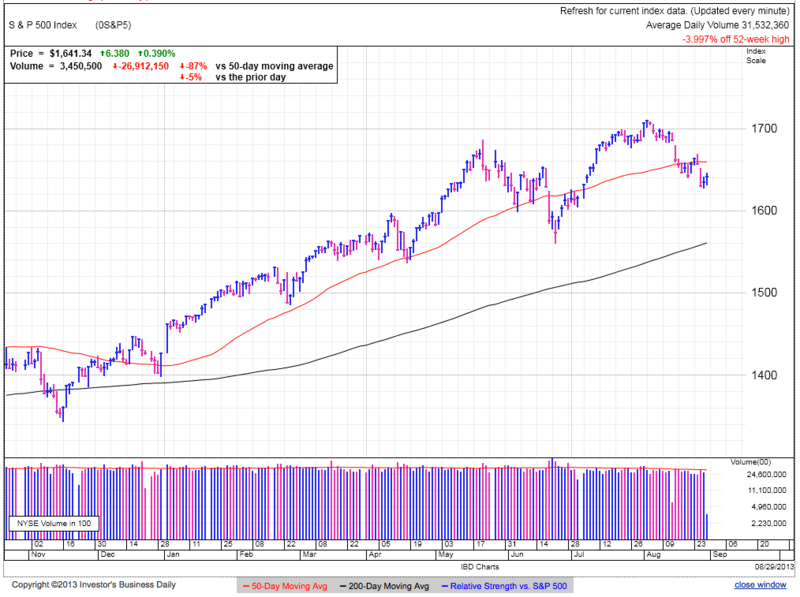 Stocks eked out minor gains and added some cushion above the 50dma. 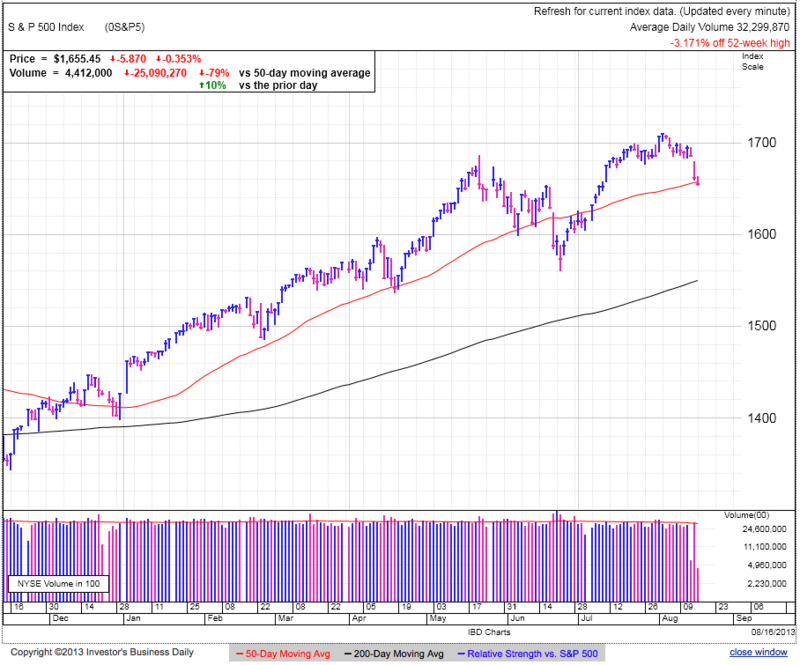 Neither bulls, nor bears have been able to move the needle in the final weeks of summer as we continue hovering indecisively around this widely followed moving average. The widely expected Tapering collapse is still MIA. In the bear’s defense, markets never move in straight lines so this could simply be a sucker’s bounce, but swift selloffs typically take our breath away before pausing and 4% is hardly breathtaking. Everyone knows Tapering is coming and it really doesn’t matter much if it starts in September or January. The Fed is ultra sensitive to the markets and it is highly likely tapering will start nominally to give markets plenty of time to adjust to a new reality. Everyone, including the Fed, knows what would happen if they abruptly shut down the program and it is unnecessary given stable inflation and anemic growth. If Tapering is already priced in, we need to keep an eye out for what comes next. Remember, markets only move when people change their minds. That means we are looking for new revelations that shows things are better or worse than most expect. Disappointing earnings out of bellwethers like WMT, M, and CSCO could be the cracks in this already weak economy. Or all this money fleeing bonds could bid up stock prices. If these things were easy to figure out, everyone would be rich. For all those worried about “War” in the Middle East, that is quickly becoming one of those Chicken Little things. Afghanistan, Iraq, Iran, Egypt, Libya, Syria, etc. Last year’s “Arab Spring” didn’t crush the market last year and is unlikely to do it this year. Everyone’s long gotten used to $4 gas and it really isn’t a big deal anymore. Outside of a revolution in Saudi Arabia, it’s business as usual. No one knows what comes next and the best we can do is trade probabilities. 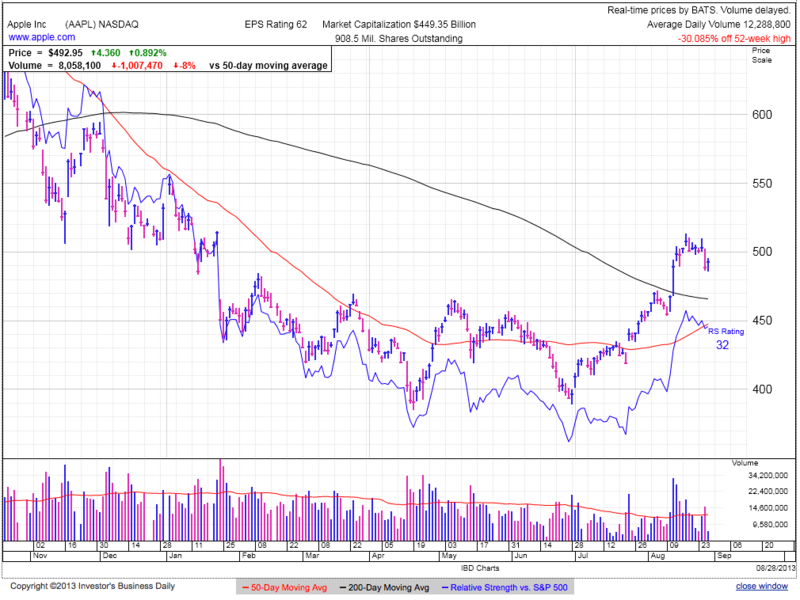 Violating the 50dma was the perfect invitation for sellers to rush for the exit and the market to collapse. But that didn’t happen and we found a floor instead. At the very least it tells us holders remain confident in the face of modest weakness. Traders often focus on demand, but we mustn’t forget about supply. No matter how dire things look, it is easy to prop up prices when supply remains tight (ie no one is selling). When in doubt, stick with the trend, especially when the market is afraid of headlines; Tapering, Syria, weak retail results, etc. A skittish market is an underweight market. An underweight market is a buyer’s market. Buying the dip is the most tired trade of the year. While it worked every other time, there will come a day when all these cocky dip buyers give back a year of profits in one swift selloff. While the odds always favor a continuation (markets continue countless times but only reverse once), we must always play defense. 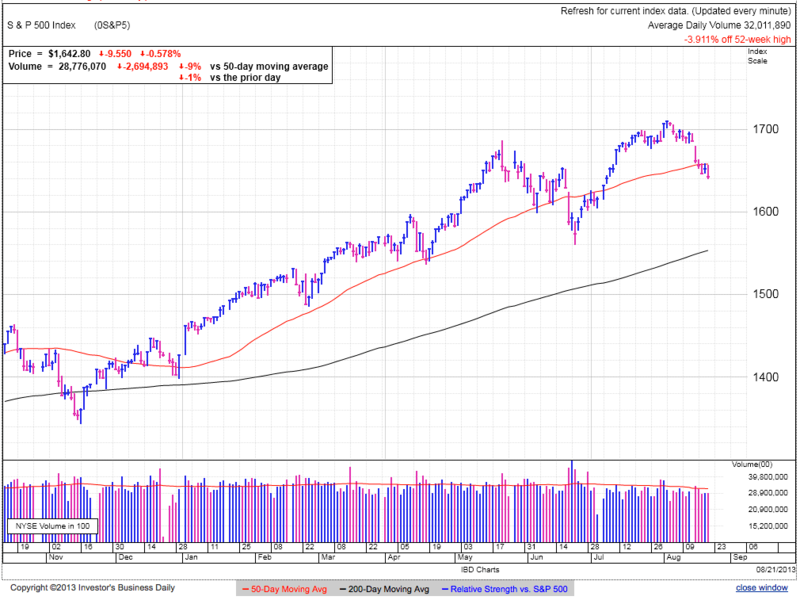 Trading above the 50dma should have triggered a short squeeze, but we only saw modest gains over the last couple days. We must always tread lightly when the market doesn’t do what we expect. While the sideways trade continues, stability favors an upside resolution. Bears need to be careful with recent profits and not let the market take those away. Adventurous Bulls can own here, but keep stops tight. This sideways trade will likely continue frustrating both sides as the market’s indecisiveness lasts into early fall. The best trade is waiting for the next trade. In coming weeks the market will let us know what it wants to do and we simply jump on board. 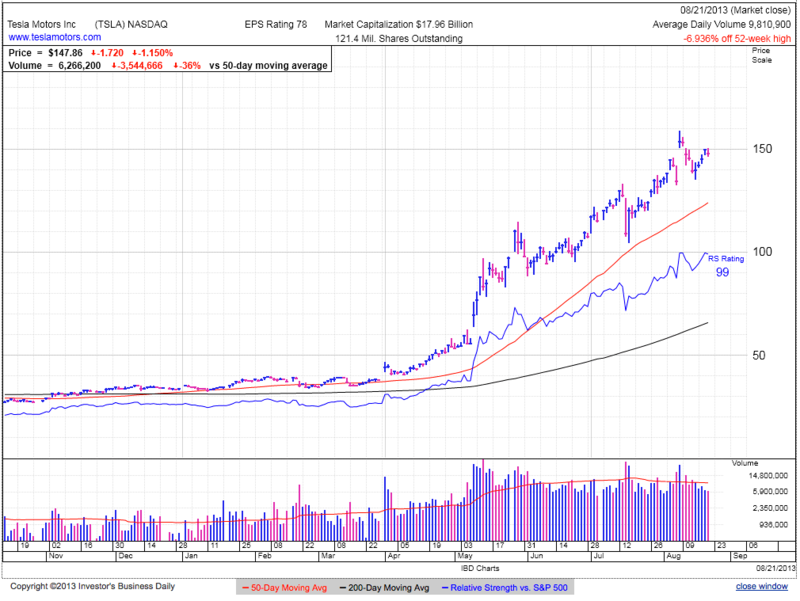 AAPL continues hanging on to $500 days before it’s widely anticipated product launch. We already know about iOS7 and people are fairly certain about the iPhone5s and the iPhone5c. Those should be well received even if they are not all that innovative, but the one thing many investors overlook is just how dependent AAPL is on corporate charity from ATT and V. Many iPhone users upgrade every two-years like clockwork, taking advantage of the $400 phone company subsidy. Years ago AAPL was in control and could dictate terms to ATT and V as high-value customers lined up to buy iPhones, but the tides have turned as Android is the most popular flavor of smartphone domestically. This is doubly good news for ATT and V. First, Android phones are much cheaper and require less subsidy. Second, they are less dependent on the iPhone and we could very well see a decrease in that all important subsidy. Even a modest bump from $200 to $300 will put a significant dent in the number of iPhone customers opting for an upgrade. Innovation or not, the day the phone companies reel in their subsidies will be a very bad day for AAPL shareholders. I have zero knowledge of anything like this happening, but it is one of the biggest risks facing AAPL shares. AM: Are we finding a bottom? 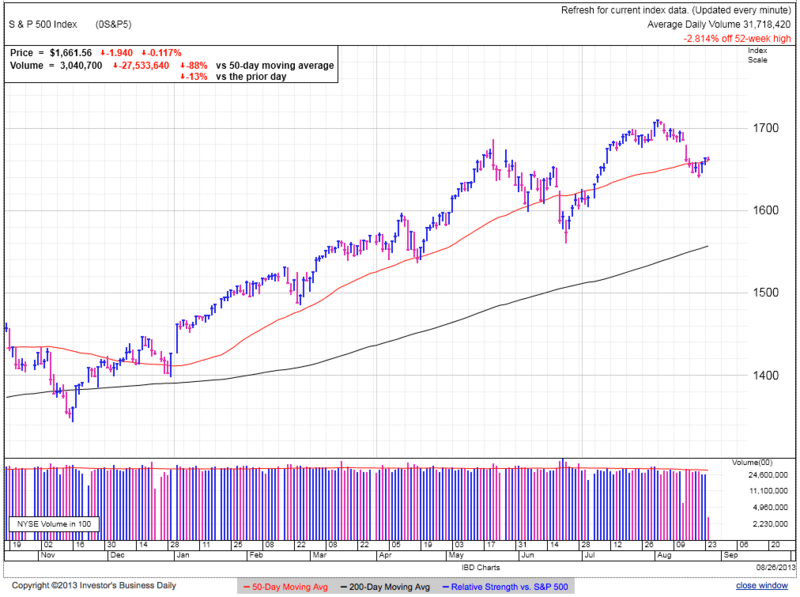 Stocks continue hanging around the 50dma as the widely expected Taper selloff is MIA. We are less than 3% from all-time highs and the market is holding together quite well. Typical selloffs are swift, while rallies grind higher. Seven-trading days near the 50dma is more grind-like than swift-like, suggesting the market is finding a temporary bottom following earlier weakness. 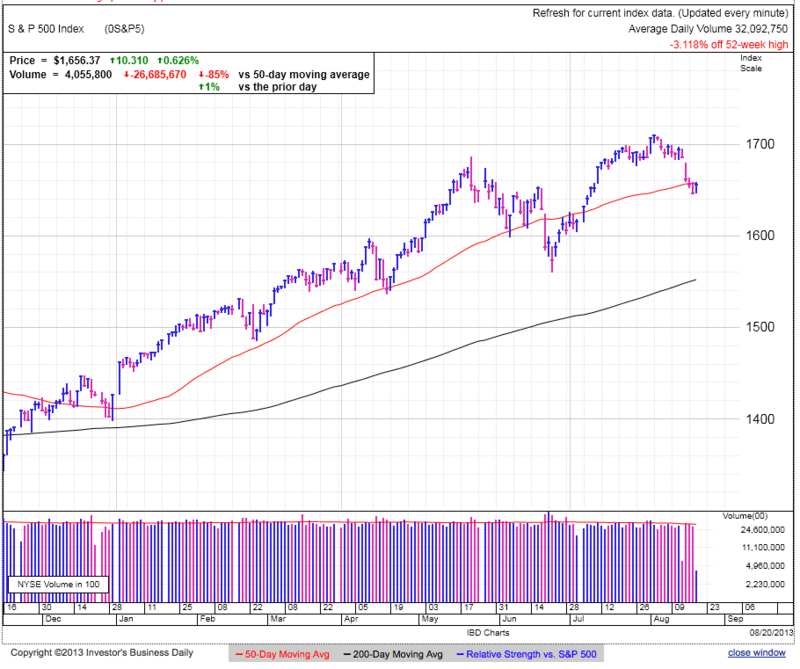 We are in the tail end of the summer trading season and will likely see more directional moves this fall. While many are obsessing over the Taper, that chatter is self-defeating and minimizes the impact of the Taper. The more the market talks about something, the fewer people there are that remain undecided. Right now traders are falling into one of two camps, those that fear the taper and those that don’t care about it. Those that fear it ran for cover early in the summer and are already in cash. Those that are not worried about it don’t respond to Taper headlines. With so few people undecided about the taper, it no longer matters. Ignoring what the crowd fears is a common theme for this blog, but it is one of the most difficult concepts of contrarian investing to have faith in. Humans by nature are pack animals and long ago natural selection wired us to be in tune and empathetic with the people around us. When everyone else was running scared, the best reaction was to run for our lives too. Anyone who stuck around to see what all the fuss was about quickly became lion food. But what worked in the wild 50,000 years ago will bleed us dry in modern financial markets. Stand apart from the crowd and exploit their heard mentality. Buy what they are selling and sell what they are buying. 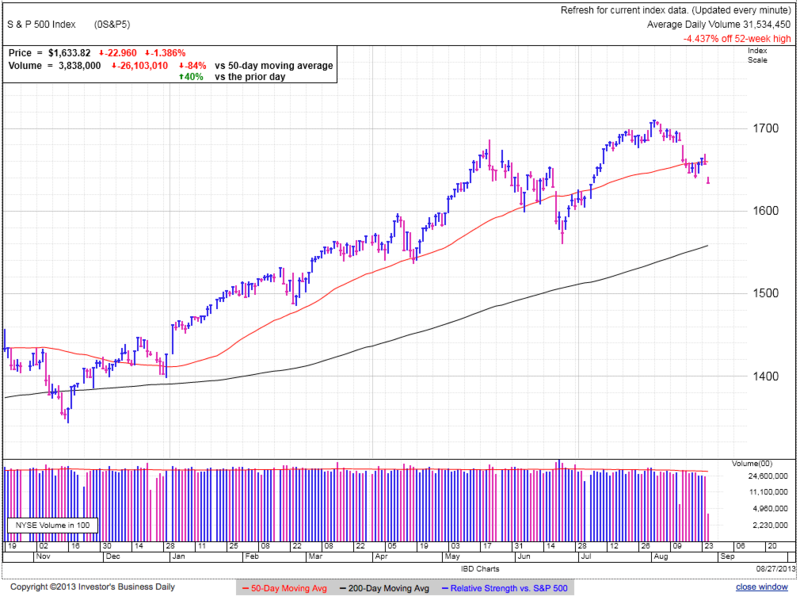 While we have not decisively broken through the 50dma, today’s support is constructive. Bears had fear and anxiety on their side, but were not able to do much with it. We have multiple 5% pullbacks every year and so far that is how this weakness is behaving. Every 5% pullback feels like the next big selloff when we are in the middle of it, but that is why they work. They shake free weak holders, clearing the way for the continuation higher. The hardest trade is usually the right trade and holding this weakness in the face of imminent Taper is not an easy thing to do. The market typically overreacts on both the up and downside. We go higher than we should and sell off further than is reasonable. This is the herd mentality taking control of otherwise rational people. All it takes is one catalyst to send already nervous traders running for cover and we always need to be careful. While the recent weakness chased off a lot of nervous holders, it is really easy to turn confident owners into nervous sellers when prices start declining. While the summer chop might continue, it seems like the recent selloff is finding a bottom and bears can use this pause to unwind shorts instead of waiting until the pain of a strong move higher chases them out. If a bear insists on staying short, keep it on a tight leash and use a trailing stop to protect recent profits. A bull can buy the break above the 200dma and use recent lows as stops. If the selloff fails to materialize, look for the market to reclaim 1700 in coming weeks. MSFT exploded higher on news of Balmer’s departure. While it is a bit overdone, this might be the emotional catalyst the stock needs to become popular again. As any regular reader of this blog knows, I think MSFT is on the right track by building full-power tablets instead of limiting users with neutered, mobile-centric operating systems like iOS and Android. The biggest risk for MSFT is appointing a new CEO that tries to turn the company into an AAPL clone by focusing on low capability devices. Hopefully the next leader will play to it’s strengths as the only real choice for anyone doing real work. In the very near future people will no longer own both a tablet and computer. Their tablet will be their computer and only one company has the universal platform to offer nearly 100% compatibility with the programs they need for work and school. 99 cent apps are great for games and todo lists, but real work requires real software. Forget iOS and Android, those are so 2012. The future is full-powered mobile devices that plug into desktop docking stations. Why choose between taking your tablet or laptop when you can take both in a single device? That is the future and hopefully MSFT’s new CEO sees that vision. No matter what the street thinks, MSFT is positioned perfectly for Mobile Revolution 2.0. Stocks rebounded from yesterday’s weak close, but still remain under the 50dma as the battle between bulls and bears rages on. The market is less than 4% from all-time highs and so far predictions of doom and gloom seem premature. Of course every 50% selloff begins with that first point lower. Interesting developments in the NASDAQ as they were forced to halt trading midday. This appears to be a computer glitch and trade should resume normally, but big moves in TSLA and AAPL prior to the shutdown could lead to unexpected trade when, or if trade resumes this afternoon. Wednesday’s swings frustrated and humiliated anyone with an itchy trigger finger. Breaking recent lows sent longs running for cover and seduced bears into shorting the obvious collapse, but minutes later the market reversed sharply, turning the tables on bears and forced them to run for cover. But the market wasn’t done, when bulls were finally breathing a sigh of relief, the rebound collapsed under their feet. This is a choppy, sideways summer market and reacting to these moves leads to buying high and selling low. Wild swings purge the market of impulsive traders who react to price moves instead of acting deliberately and thoughtfully. Those that bought or held the volatility demonstrated calmness and confidence in their outlook. Replacing impulsive traders with thoughtful owners is always good for stability and typically favors price increases. The objective of every shakeout is getting rid of weak holders before resuming the uptrend. Violating the 50dma and recent volatility moves us toward that goal. The thing we are left wondering is if this shakeout was big enough, or if we need to cut deeper first. 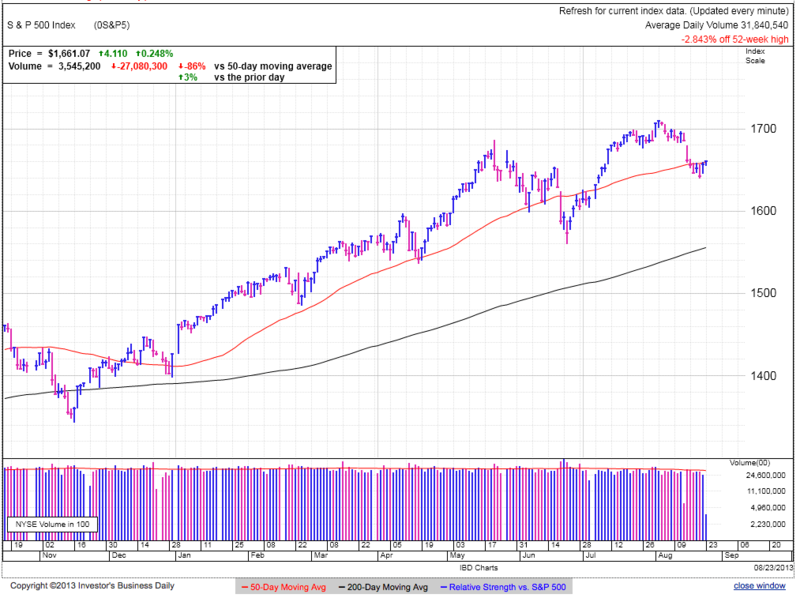 The market recovered most of yesterday’s losses but failed to find buyers willing to push it back above the 50dma. The market price is the exact balance point where you have equal numbers of bears and bulls on each side. 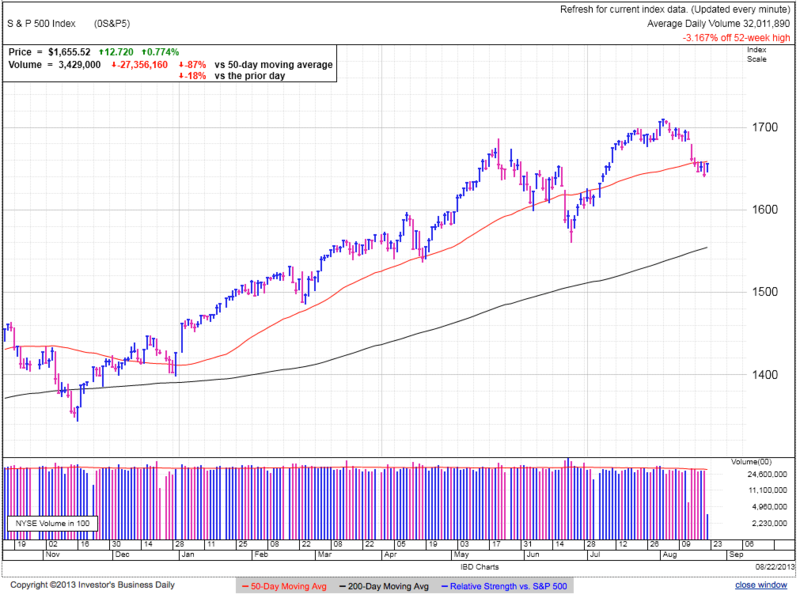 Traders were willing to buy yesterday’s weakness, but demand tapered off as we approached the 50dma. I want to buy 1655, but only if other traders are willing to follow me in and that is not the case today. I still believe in the rally and am looking to buy the dip, but I would rather be a little late there than a lot early. Sideways trade is constructive for a rebound, but only if traders are willing to buy the rebound. If buyers continue stepping away every time we approach resistance, the market will eventually fall under its own weight. Shorts can continue holding, but keep tight stops and take profits proactively because they will likely evaporate days later. Either we bounce here and resume the uptrend, or the shakeout takes another leg lower. It is hard to know for sure so we wait for the market to show it’s hand. Breaking above the 50dma will send shorts running for cover and their buying will start the rebound. Of course further weakness will turn currently confident holders into nervous sellers. No matter what it feels like, the up-trend is still in tact, so we can hold positions in the direction of the trend longer and should capture counter-trend profits more proactively. We are still in the tail-end of the summer trading season and expect the indecisiveness to continue until big investors start moving money around in preparation for year-end. Not much to talk about since the NASDAQ halted trading. This will be a non-issue assuming they resolve it tonight. If it carries through tomorrow and the weekend, it could lead to larger gaps when trade finally resumes, but we made it through the Sandy shutdown and this will be much of the same. PM: Have we come too far? Dramatic swing of emotions as the market digested the Fed minutes. We opened lower and fell immediately following the minutes release, but the market rebounded and reclaimed all the day’s losses, but just when everything seemed normal, we collapsed to close near the day’s lows. The market retreated from the 50dma on surprisingly light volume given the hype around the Fed minutes and dramatic trade that ensued. In spite of all the excitement, few traders seemed to care and sat on their hands. The market closed at a new relative low and the next meaningful technical level is 1600. The Fed statement came out and was as wishy-washy as ever. I have yet to find a single person whose mind was changed as bulls and bears remain married to their positions. The market is forward-looking and the Taper trade is ancient history, but it makes for good TV and is why the media keeps talking about it. Honestly, what is the impact to the stock market 6-months from now if the Taper starts in September or January? This is all manufactured hype and the market is already focused on what comes next. This rally will end at some point, but a 15% annual gain is fairly typical and anything but too-far, too-fast. A 27% annual return barely breaks into the top quartile, meaning we could easily see another 10% of upside from here and still fall within normal market behavior. Source That doesn’t mean we won’t see near-term volatility, but the crowd loves to hate this rally and is the fuel that keeps it going. Markets climb a wall of worry because by the time the world finally feels safe, everyone is fully invested and there is no one left to buy. I bought yesterday and was stopped out today. That is just the way it goes. I took a calculated risk, speculating we ran out of sellers under the 50dma and it didn’t work out. That doesn’t make it a bad trade and if I had to do it all over again I would. The key to success in the markets is not the individual outcome, but the process. Stick with a sound trading strategy and over time we come out ahead. There are always trolls who criticize other’s mistakes and brag about their successes, but those traders are often washed out within a year because they focus on the outcome, not the process. I was disappointed by today’s close and it suggest more downside is possible. While I still believe this is a temporary pullback, sellers remain in control and we need to wait for that next entry point. Reclaiming 1655 in coming days would get me back in, but for the time being I’m just a spectator. Every rally ends and this one is no different. The high a few weeks ago could be a double top that is too much for this aging bull to overcome. Shorts can continue riding the downward momentum, but keep that trade on a short leash and cover if we reclaim the 50dma. The bull market is still intact and any counter-trend trade needs to be nimble and capture profits early and often. For the nimble swing-trader, cash or short is the only trade to have here. The bull should buy 1655 and the bear covers at this level. AAPL is resting above $500 after sprinting to this level on a combination of less bad than expected earnings, imminent product launch, and Icahn buying a “large” stake. According to Apple rumor blogs, the iPhone5s and a cheaper iPhone5c are pretty much done deals. Some expect a fingerprint reader on the more expensive model and there are differing reports on how much the new “c” model will cost, but most fall between $300 and $400. If that is all we get, expect the stock to fall as traders sell the news. I’m quite confident this is not the last time we will see $500, so there is little risk to locking in profits and waiting for the stock to consolidate recent gains. If we continue higher, there is plenty of time to get back in. TSLA struggles with $150 as the recent earnings release failed to ignite another upside rampage. The stock is already up 325% for the year and most of the good news and expectations have already been priced in. I’ll leave it to others to decide how much a car company that in its entire existence only sold two-days of GM sales volume is worth, but from a trading perspective this hot stock needs some cooling off. Look for a retest of the 50dma in coming weeks. Two-steps forward, one-step back. Stocks bounced following yesterday’s slide. 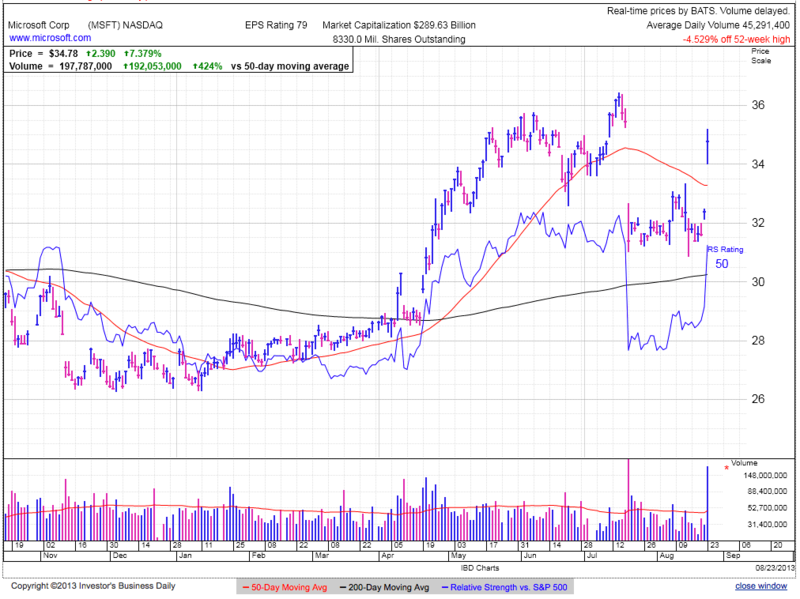 We traded up to the 50dma as both sides watch intently to see what happens next. The market remains comfortably inside the summer’s trading range, but every pullback this year stalled shortly after challenging the 50dma. The market found a floor after briefly violating the 50dma. The million dollar question is if we bounced because we ran out of sellers, or if all the Johnny-come-lately dip-buyers are temporary propping up the market before the next leg down. To figure that out we need to see what people think and how they are positioned. 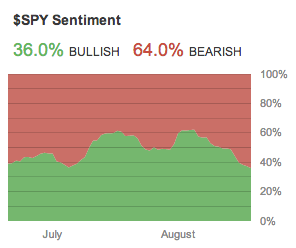 This morning’s bullish sentiment on StockTwits’s fell to a paltry 34%. While not a scientific sample, it shows many people don’t believe in this market and are expecting lower prices in the near future. Some could make the argument StockTwits users are more engaged and informed than the average market participant and their opinions are more insightful than contrarian. While there is plenty of logic in this assertion, it is easily testable. All we need to do is look back at the last dip in June to see what StockTwits users thought. Coincidence or not, this low coincided with the last time StockTwit’s SPY bullish sentiment was below 40%. Obviously the next argument is, this time is different. While we are down from different headlines, the market participants are all the same. How they responded to that last selloff will have parallels to how they respond to this one. The whole reason contrarian trading works is people trade their opinions. Bears are in cash or short. Bulls are long and on margin. When the crowd shares a similar opinion, that means the crowd already acted on those insights. In this case it means 66% of a group of StockTwits users are underweight or outright short this market. They already sold and there is little these traders can do to further pressure the market. Once all the like-minded people with bearish outlooks sell, supply dries up and the market responds “irrationally” by bouncing at the exact moment when everyone expects it to collapse. No doubt the market could continue lower as other confident holders start to doubt their positions and sell ahead of the impending collapse, but that is the nature of the game. No one knows what will happen next, but the successful trader looks for opportunities when the risk/reward are in his favor. Today’s bounce is an excellent buying opportunity with clearly defined risk. The bear thesis predicted falling under the 50dma would set off a second wave of stop-loss and emotional selling. That was supposed to be the trigger that accelerated the selloff. Yet we bounced this morning as the stop-loss and emotional sellers failed to materialize. When the market doesn’t respond as expected, we need to reevaluate our outlook. Bears expecting a swift leg down need to be careful when the market refused the perfect setup for one. I don’t buy bottoms,but I do buy strong moves the opposite direction from what everyone expects. Some will criticize my call a couple of weeks ago where I expected support at 1700. Obviously I was wrong, but in the markets every trader must make a critical decision, do they need to be right or do they want to make money? This is important because these are two very different things. My goal is making money and I’m actually glad I was wrong. Like most disciplined traders I was stopped-out at 1695, locking in earlier gains. From there, the market continued falling, but this is where the magic happens, the selloff allowed me to buy back in this morning at 1655. Where we go from here is yet to be seen, but I have the opportunity to make 40 points of additional upside simply because I was wrong two weeks ago. Given outcomes like that, I have no problem being wrong and I hope many readers feel the same way. Every dip this year was buyable. No doubt the crowd is starting to notice and when too many people recognize and trade something, it stops working. In this case it isn’t the dip buyers that will take us down, but the confident holders that keep holding the dip. There is nothing that shakes confidence like a screen full of red ink. Like any dam that bursts, it starts with a crack and accelerates from there. No matter how confident owners are and what the fundamental outlook is, once panic grips the markets, people sell first and ask questions later. The best protection is disciplined use of stops. When we stick to our rules, we can take calculated risks. On the other side, anyone short the market needs to be careful. I would take profits, not add new shorts. The market is flirting with reclaiming the 50dma and that will trigger a short squeeze. Remember, the goal isn’t to make all the money, just the easy stuff. If we nose over, there will be time to jump on the short bandwagon again. This morning’s bounce makes for a low risk, high reward entry. Buy the bounce with a stop under 1650 or 1645. We are risking 10-points with a potential upside of at least 50. Even if the odds are against us, this highly asymmetrical trade is attractive. When we combine other factors such as the sentiment skew and lack of a plunge following yesterday’s selloff, the odds are actually on our side too. At some point this rally will end and we must be ready for it, but when in doubt, stick with the trend. AAPL gave back yesterday’s gains and is retesting $500. 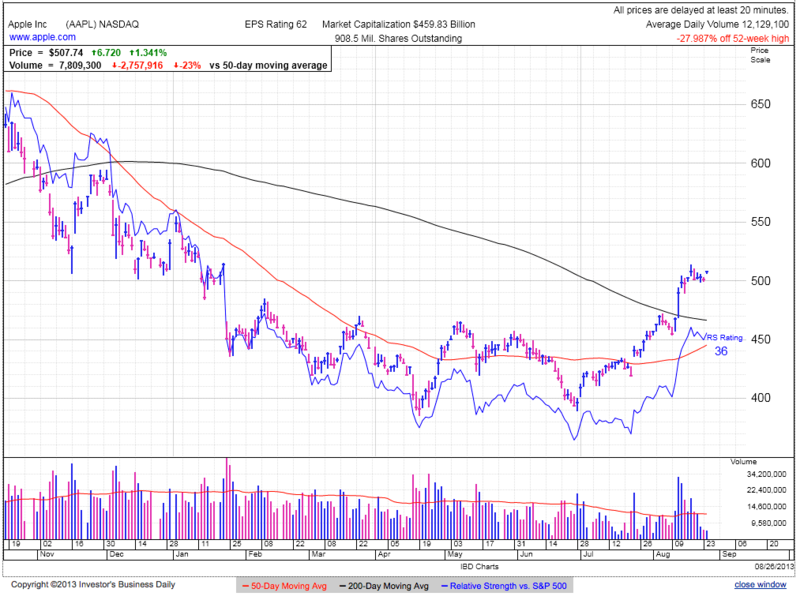 This was key support last year and is an important round number to watch here. While my preference taking profits after a strong run, traders can use a trailing-stop under $500 to protect recent gains. There are a lot of Johnny-come-latelys following Icahn’s tweet and in anticipation of the iPhone refresh. Is the ‘cheap’ iPhone already priced in, or will it catch a lot of people by surprise? My guess is most already expects it and thus already priced in. Unless AAPL shocks us with something new and unexpected in Sept, this feels like a buy the rumor, sell the news trade. AM: Is the rally over? Stocks remain a hair under the 50dma, but so far have not triggered a second wave of stop-loss selling after violating this widely followed moving average. The summer season is coming to a close and expect more meaningful portfolio adjustments by the big guys in coming months as they prepare for year-end. Many times this means directional trade as opposed to this summer’s sideways moves. Aside from a couple of brief excursions, the market remained between 1600 and 1700 since May. Currently we are in the middle of this range as traders continue arguing between buying the dip and shorting the impending collapse. The market price is the exact balance point between bulls and bears and as of today, that puts us exactly in the middle of the summer’s trading range. By itself this is neither bullish nor bearish because both sides have equally valid arguments, so we have to peel back the layers to uncover more meaningful insights. We know selloffs are typically swift as selling begets more selling. Halting the slide and holding this level into Tuesday will largely end last week’s selloff and it will take a new catalyst to reignite it. Maybe that is new earnings data to further pile on WMT, M, and CSCO’s disappointments. Maybe it is more technical selling as we slip under the next tranche of stop-losses. And of course both of those could set off another round of emotional selling, pushing us down to 1600. But barring those outcomes, this slide triggered a mountain of selling and any sustainable rally is two-steps forward, one-step back. We should expect dips, not fear them. Reactive traders buy high and sell low. Proactive traders lock-in profits and buy dips. Last Thursday’s plunge rattled traders and StockTwits’ SPY sentiment fell 25-points over a couple of weeks. This is the lowest it’s been in recent history. (The last time was mid-June and we know how that turned out.) This somewhat contradicts Friday’s Yahoo Finance poll that shows many believe this is just a routine dip. Timeframe is everything in the markets and Yahoo Finance readers could very well be different from StockTwits users. I have nothing to back this up other than my intuition, but I expect Yahoo readers skew toward buy-and-hold where StockTwits skews heavily toward day-trading. Both pieces are valuable insights into what comes next. Likely we are getting closer to the end of this near-term dip, but the larger rally is at tad overdone and at risk of breaking down in the medium-term. Timing is everything in the markets and hopefully these insights give us an edge. Holding this 1650ish level through Tuesday shows we ran out of sellers and there are enough value buyers snapping up discounted shares to halt last week’s slide. It is dangerous to catch a falling knife, but a four-day bottom is often long enough to end a downward move, allowing us to buy the dip. Those that wanted to sell and short have already done so, relieving much of the selling pressure on the market. Once that supply dries up, it is easier for the market to rebound. Many holders remain nervous and uncertain. They are watching the market intently and on the verge of selling either when the market crosses their stop-loss, or cutting bait when pain from losses gets too intense. Hope is a poor strategy and everyone has their breaking point. Nothing turns confident holders into emotional sellers faster than a tidal wave of red ink. Wait for support and strength on Tuesday before jumping in. Shorts have nice profits and can continue holding, but they need to protect these gains. If the selloff doesn’t take another leg down after violating the 50dma, it signals most of the selling is already behind us and they need to take profits. Stocks traded sideways at the 50dma following yesterday’s 1.4% selloff. Volume for the dip was only a few percent above average, surprisingly light for the largest loss in months. This shows many money managers remain on vacation and the lighter volume exacerbates volatility. Light volume can also be explained by confident holders unwilling to sell dips and few are rushing for the exits. Yesterday’s one-way selling is taking a break as most wait to see what happens next. This pause alleviates some of the anxiety and gives traders time to make rational and deliberate decisions. That doesn’t mean the selloff is over, only that the initial wave of emotional selling came and went. Ironically the most bullish move is more selling. Dipping under the 50dma triggers a second wave of stop-loss and emotional selling, setting the stage for a capitulation bottom. This is exactly what happened in June, leading to our recent 140-point surge, but that is only one possibility. Yahoo Finance had another insightful poll this morning. Over 60% of respondents are either not worried about the dip or buying this weakness. That shows complacency creeping in, not surprising since every other selloff this year ended in a rebound to new highs. The challenge with sentiment is figuring out how far this will go before toppling over. We certainly have a majority, but do we need 80% before it becomes unsustainable? Just like everything in the market, there is no clear answer and it largely depends on how quickly sentiment shifts as the market dips. A rapid selloff accompanied by a sharp reversal in sentiment will find a bottom quickly. That is what happened in June. A slower grind lower as stubborn owners refuse to sell will take longer and is typical of an erosive bear market that takes us down a few points at a time. Plunges are scary, but bounce quickly. Grinds lower don’t scare us, but they do more damage as the series of lower highs drains our accounts under our noses. The market is at a critical juncture and the best place is cash until we have more clarity. While this could be another buyable bounce, we want to see the market hold these levels for a few more days before we assume the market found a bottom. 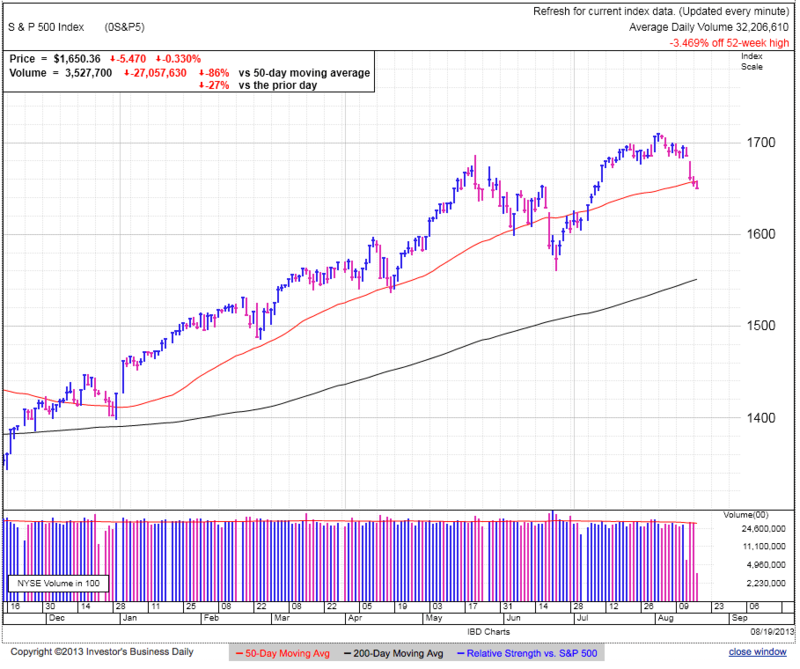 Temporary dip-buying can prop up a market for a couple of days, but holding for four days demonstrates real support. Shorts can stay short, but should move their trailing stop down to 1670 to protect recent gains. In the choppy summer market, we are best served by taking profits early and often. That has been the best counter-trend trade this summer and is not a bad decision here. The most bullish signal will be a violation of the 50dma followed by a strong reversal. That shows stop-loss, emotional, and short selling exhausted itself in a capitulation bottom. Bears expect us to crash through the 50dma but if that doesn’t happen, they have to be flexible enough to recognize further emotional selling is not happening and they need to lock in profits. 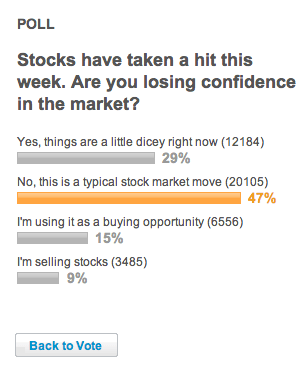 Without a doubt the market is becoming more and more complacent as proven by the Yahoo Finance poll. All these confident holders are a few points from becoming panicked sellers. Recent economic concerns over earnings from WMT, CSCO, and M are giving some money managers doubt and their lightening up could be the start of something more. Remember, markets only move when people change their minds and adjusting outlooks based on these bellwether companies could be the straw that broke this rally’s back. Patience is the name of the game. While we come to this with biases and expectations, let the market make its move first. It is better to be a little late than a lot early. A bounce off the 50dma early next week is buyable. Breaking the 50dma by itself is not automatically bearish. We need to see an acceleration that shows previously confident holders are rushing for the exits. 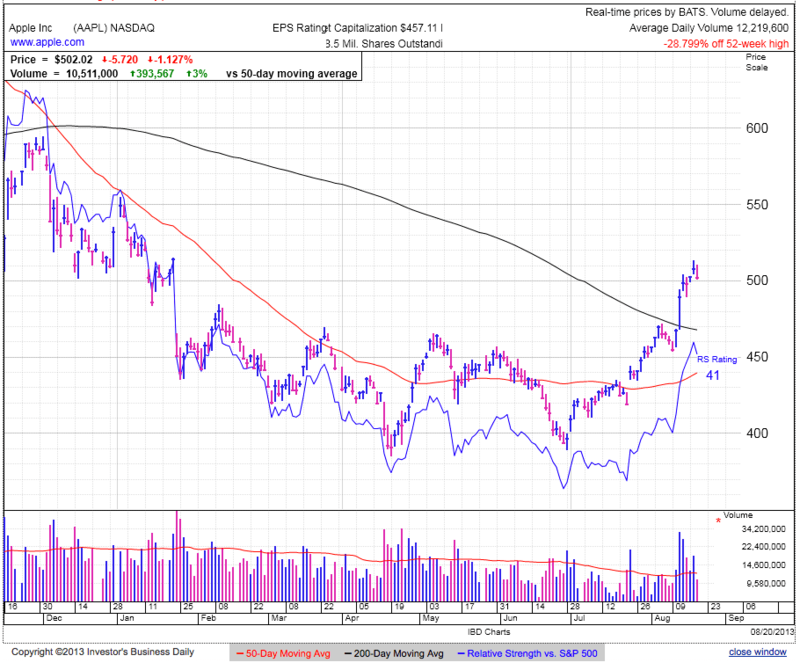 If a dip under the 50dma quickly stalls, that means selling is drying up and we can buy the rebound above the 50dma. TSLA closed the earnings gap and is down 10% from the post-earnings high. A lot of people bought the earings breakout and shorts covered, but since then few have been willing to pay top dollar and are waiting for better prices. 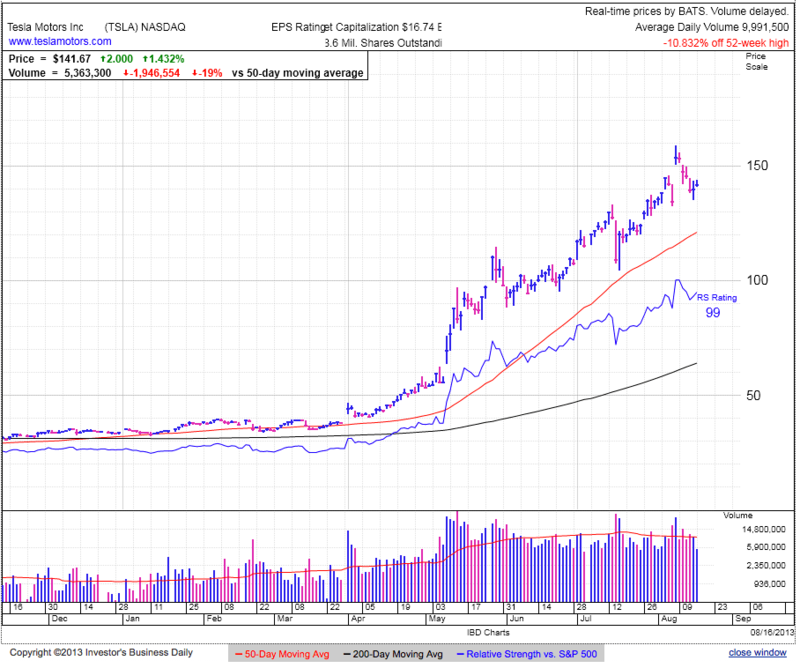 This stock has a history of strong surges followed by month-long consolidations, so even under best conditions we should expect sideways trade here. The bigger test will be when the 50dma catches up in coming weeks. Will we get another bounce, or will that be an excuse for people to lock-in profits? The next greater fool theory applies to all momentum stocks no matter how sound the underlying fundamentals. TSLA will top when there is no one left to buy. Just ask anyone who held AAPL through the record-setting iPhone5 launch last year. Speaking of AAPL, it is pausing at $500 following the Icahn pop. While a lot of retail investors are excited to ride on his coattails, it is fairly safe to assume he waited until after he bought his entire position before promoting it to the world. That means his buying will no longer prop up the stock and he is simply along for the ride like everyone else. 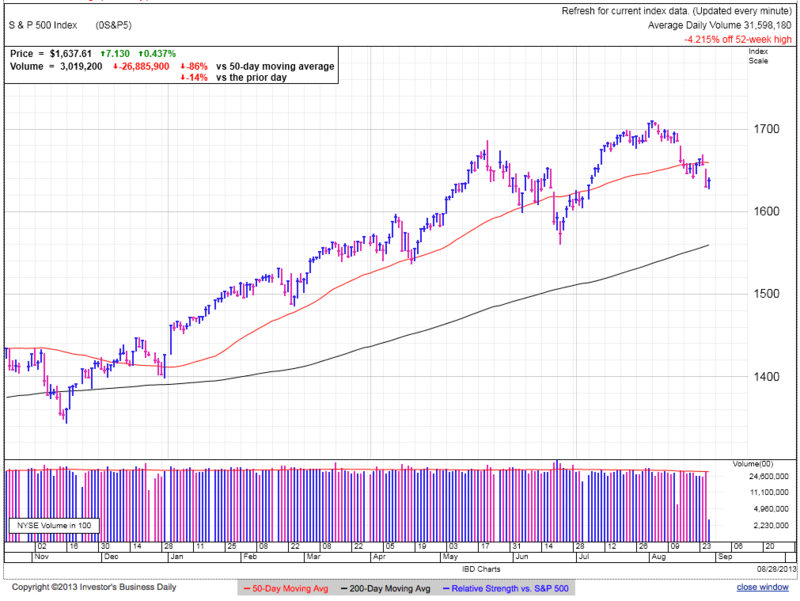 In fact, depending on how much he bought, he could be responsible for the some of the recent rally up to the 200dma. We will soon learn what happens without his massive war chest bidding up the price. The market is eagerly awaiting AAPL’s “low-cost” phone so it can stem the market share losses to cheaper Android phones. The thing investors need to worry about is if this iPhone5c is too successful and actually becomes AAPL’s leading seller at the expense of its more profitable big brother. There is precedence in the iPod lineup. Soon after launching the smaller and less expensive iPod mini, it quickly became AAPL’s best seller. The Mini was eventually replaced with the Nano and now the larger and more expensive full size iPod is on life support. If the iPhone5c’s price and profits are half that of the iPhone5s, AAPL will eventually need to double sales just to stay where they are at. This is why many are concerned about hardware price wars catching up to AAPL’s stellar profit margins.